They use water to cool and filter the smoke before it enters the smoker’s lungs. They allow the user to inhale a large amount of smoke very quickly. To use a bong the user inhales through the gap at the top and put a flame over the substance that they are smoking. All bongs have a shottie that the smoker puts there finger over whilst doing this to keep the air in, and once the substance is burnt out the finger is taken off and all the smoke is inhaled directly into the users’ lung. This is a simple water bong used in the way described above. See also Water Bongs. This bong uses a half bottle put into water and is slowly pulled up making the smoke very quickly enter the lungs of the user. In this case the water is not used to filter the smoke but to create a consistent flow of smoke. See also Gravity Bongs. This is a bong that can be made on the run, it’s simply a can with holes in it and smoke through the opening at the top. 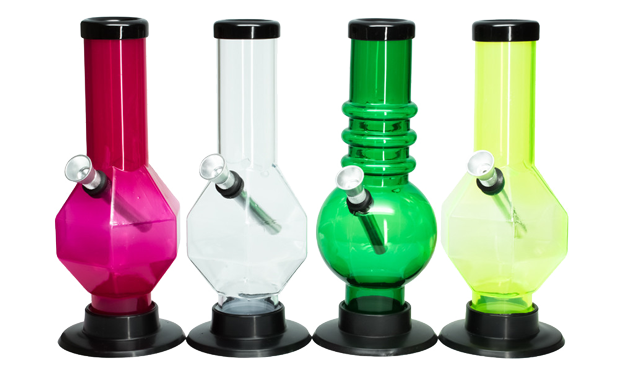 Bongs that are purchased can be made out of many materials such as acrylic, metal and plastic. These bongs are often more durable and air tight than the home made bongs but both are quite effective. Other more novelty bongs are available such as the double chamber bong – allowing for a super effective smoke, using two chambers instead of one. Alternatives to a bong are joints (cannabis and sometimes tobacco rolled in a paper), vaporizers (these heat up the marijuana to the right temperature releasing the THC in the substance creating no smoke but still inhaling it into the user’s lungs) and pipes (these can again, be home made or bought).